Shotgun certificate renewal reminder - do I have to hurry up and reapply? I’ve just received a reminder to renew my shotgun certificate – what should I do next? Should you hurry or can you take your time? I’ve just received a renewal notice for my shotgun certificate. Is there a deadline by which time I have to get reapply and back to the police? A: There is no legal deadline, which is rather odd when you think about it. On the other hand, shotgun certificates can take months to come through, depending on where you live in the country. In any case, you couldn’t reasonably expect the police to turn the renewal round in time if you only get your application in the day before your licence expires. I recommend you aim to get the paperwork for your renewal in at least eight weeks before expiry which will give reasonable time for the police to do their side of the business. If for some reason you can’t make the eight week deadline drop them a line or give them a ring to explain why. Whatever you do don’t send in the expiring certificate because you may need it for a variety of reasons. If, after giving eight weeks notice, you don’t get the certificate back on time you should insist on being given a Section 7 temporary permit. There is no other way in which you can remain in lawful possession of your guns if the certificate is not renewed. 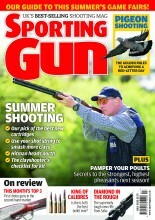 What happens if you admit to health problems on your shotgun licence renewal? A certificate is valid for five years, after which it must be renewed if you wish to continue to possess shotguns. A new certificate costs £79.50 and renewal is £49. There is no limit to the number of shotguns that can be held on certificate and you do not need to get another certificate each time you buy a gun. It may speed up your renewal application if you include a photocopy of your existing certificates. You do not need to return the expiring certificates. Keep your original certificates with you whilst waiting to receive the renewals. You will need them to buy ammunition and prove lawful possession of your guns.